adobongblog: I love our dinner! Thank goodness for the Asian store... every once in a while we can enjoy the simple joys of simple Filipino food. 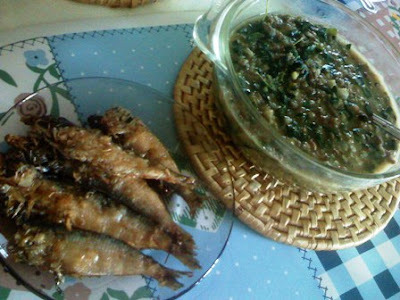 Last night we had no other than munggo (mung beans) and tuyo (dried fish)! Having food like this on the table remind me of rainy days in Baguio. You hear the incessant downpour outside but then the overpowering smell of the dried fish would teasingly invite you to the dining table. And the munggo! I would ask my Nanay to set aside some cooked mung beans before she would pour it onto the fried pork bits. My cup of cooked munggo would then be mixed with a bit of sugar. Mmmmm... I love having munggo that way. And of course, the viand version is just as great! My wife was thrilled when she saw these stuff at the Asian store. The tuyo costs around 4.50 and it's good for a couple of meals for two. It was likewise a surprise when there was dahon ng malunggay for sale! That completed the munggo recipe. But you'd be surprised... that small bundle of leaves cost $2.50! That would be somewhere around 50 pesos! But then again, it's imported. Suddenly, simple joys are no longer simple but what the heck... we still love our dinner!